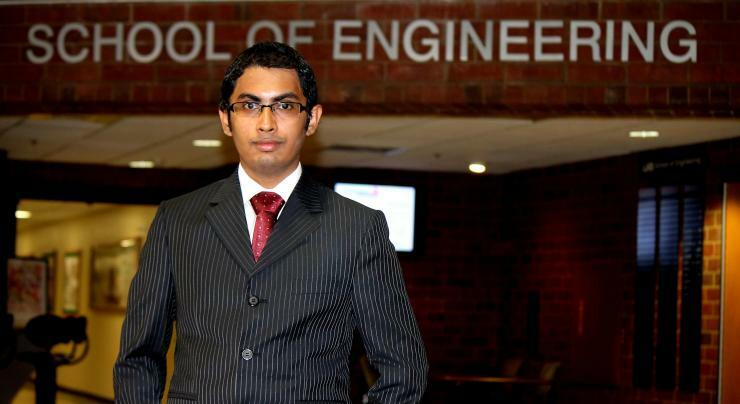 A K M “Arif” Arifuzzman, a new Ph.D. student in the Georgia Tech School of Electrical and Computer Engineering (ECE), has received an Aga Khan Foundation International Scholarship. The Aga Khan Foundation provides a limited number of scholarships each year for postgraduate studies to outstanding students from select developing countries. After a three-step rigorous review and interview process, Arifuzzman was among 29 students from 13 countries selected for this scholarship this year, and he was the only student chosen from his home country of Bangladesh. Arifuzzman is a member of the Biomedical Systems Laboratory, where he is advised by ECE Assistant Professor Fatih Sarioglu. Arifuzzman’s research is focused on developing low cost, portable lab-on-chip systems to be used at the point-of-care and in resource-limited settings for performing sophisticated biomedical tests, which currently require well-equipped hospital laboratories. Before coming to Georgia Tech, Arifuzzman earned his B.Sc. degree in electrical and electronic engineering at the American International University-Bangladesh in 2011 and his M.S. degree in electrical engineering at the University of Alabama at Birmingham in 2016. To learn more about the Aga Khan Foundation International Scholarship Program, please visit http://www.akdn.org/our-agencies/aga-khan-foundation/international-scholarship-programme.